There were certain companies that I knew I wanted to do business with going into this project. One of those companies was Pure Choice Motorsports. In case Pure Choice is a name you haven't heard of let me get you up to speed. 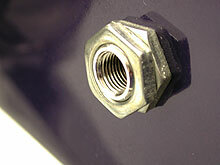 They offer cool plumbing fittings for brakes, fuel systems, and transmissions. Pure Choice has supplied fittings for many well-known street rods and professional builders and will be supplying all the brake, transmission and fuel fittings needed for Project33. I had an idea of how I wanted to plumb the brake system so I drew it out on a sheet paper and faxed it to Pure Choice to get their expert opinion. There are a few strange fittings I would need to plumb the project as planned and Pure Choice Motorsports stocks more unique fittings than any place I know. Above is a quick shot of the fittings needed for the brake system. I'll list the purpose of each fitting as we progress. I have decided to run steel 3/16-inch line instead of stainless steel partly to hold cost down, since you do really see the brake lines anyway, and because I already own a 45 degree flaring tool and stainless lines use a 37-degree flaring tool. Not only did I not want by a new tool just for this job, but by using steel I'm assured I can find emergency repair pieces wherever I travel. Steel lines are also much easier to work with. To make the lines look better I'll steel wool them and spray them with clear. Since this is a high boy coupe and the frame is exposed I've decided to use through the frame brake bulkhead fittings both front and rear for a super clean appearance. I'd already purchased the fronts when I was building the frame. There was one thing that bothered me about them - they have no washers. The first thing I did was to put a stainless washer under both front and back. This meant there wouldn't be enough thread for the double lock nut arrangement they come with so I opted to Locktite the single nut. I think it looks better with a washer. Now I won't have to worry about marring the paint if it ever spins. Once in place I doubt it will ever want to move however. 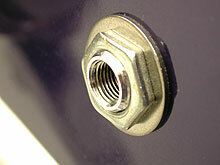 This photo and the one above show a front bulkhead fitting from the backside (inside) of the frame rail. 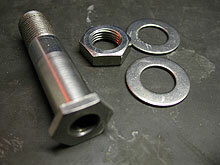 These fittings normally come with a male fitting on the outside and a pipe thread fitting on the inside. 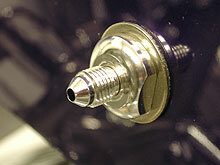 This is what was used on the front where the brake hose heads directly toward the caliper. 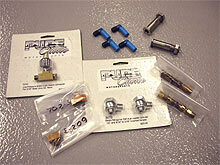 For the back of the car we'll be using special fittings from Pure Choice that are female on both sides. The reason for this is because I need to make an immediate 90-degree turn to keep the flexible brake hose between the wheel and the frame. These fittings are made of stainless steel so they will always look as beautiful as the day you installed them and low maintenance is a good thing.